Islamabad, Pakistan, 29th September 2017: Media Matters for Democracy is extremely concerned about another suspension in cellular services in Pakistan around Ashura, just before the observance of 9th and 10th of Muharram processions. The services were allegedly suspended in more than 30 cities and districts of Pakistan, and are feared to get worst on 9th and 10th of Muharram (30th September and 1st October 2017). According to our sources and media reports, cellular services in Sindh were suspended in Karachi, Larkana, Sukkur, Hyderabad, Jacobabad, Kashmore, Khairpur, and Shikarpur. In Punjab, Faisalabad, Jhang, Sialkot, and Bhukkur suffered the blockage. Baluchistan got most affected, with suspensions in Quetta, Mach, Bolan, Sibi, Jhal Magsi, Ghanda Wah, Bhag, Naseerabad, Jaffarabad, Subat Pur, Dera Murad Jamali, Usta Muhammad and Dear Allah Yar. 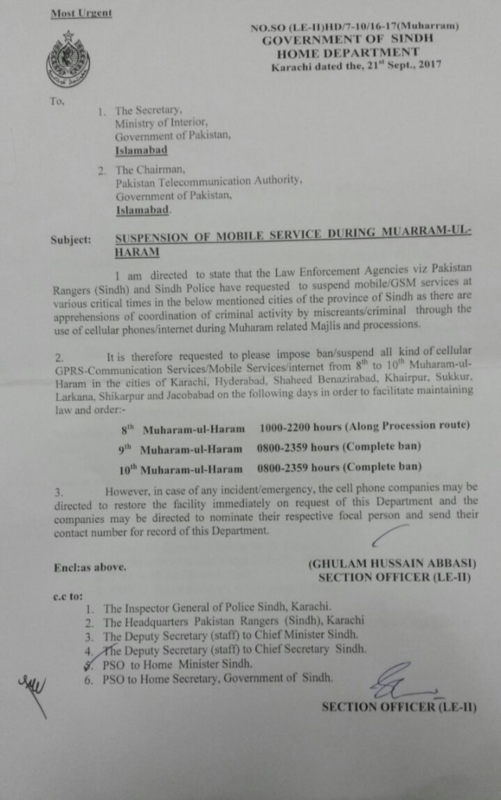 According to a copy of the official notification of Sindh Government (acquired by Media Matters for Democracy) sent out to Pakistan Telecommunication Authority and the Federal Interior Ministry of Pakistan, the network shutdowns in the cities of Sindh were requested by Sindh Police and Rangers, and were termed ‘necessary’ to maintain law and order. The notification, however, also requested the immediate restoration of services in ‘case of an emergency or an incident’. Similarly, according to media reports, Peshawar City Police has requested the provincial government a suspension in cellular services on 9th and 10th Muharram in the ‘view of security threats’. Speaking to our reporter, an official at Ufone Headquarters in Islamabad said that the government suspends cellular services in specific hours in different parts of the country every year for Ashura. The interior ministry didn’t take us into confidence in this regard, he added. The official spokesperson of Federal Ministry of Interior, when contacted, held that so far no plan has been devised to suspend the services. He confirmed the queries and complaints related to shutdown though. He added that before the suspension of cellular services, the Ministry would announce its plan. “ Network shutdowns are often ordered by the federal government under sub-section-II of Section 54 of Telecom Act which states that during a war or hostilities against Pakistan by any foreign power or internal aggression or for the defence or security of Pakistan, the federal government shall have preference and priority in telecommunication system over any licensee”, said Media Matters for Democracy’s Director Asad Baig. “The government however under the guise of this section casually suspends services on a whim. Not only that its unconstitutional, its also a gross violations of citizens’ fundamental rights”, he added. Media Matters for Democracy express grave concerns over these shutdowns and maintain that access to Internet and telecommunication services should be treated as a basic human right and under no circumstance should be interrupted, or controlled in any way or manner. There is no empirical evidence available that network shutdowns prevent or otherwise obstruct terrorist activities. On the contrary, not being able to contact or communicate can potentially disrupt the lives of the citizens. We call upon the government to respect the fundamental rights of the citizens of Pakistan and urge them to devise a more meaningful strategy to deal with terrorism and law and order situations than mere network shutdowns. Shutting down communication networks only adds to the disruption and chaos and is never a solution. Shutdowns negatively impact a range of fundamental rights and can prove to be extremely dangerous, especially during the time when the threats are high, or in public processions, when the ability to communicate is crucial for personal safety.